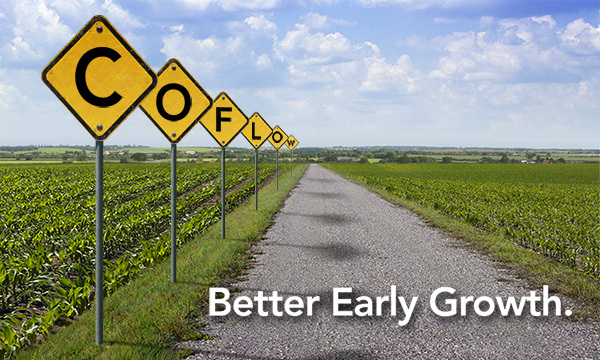 The smarter seed treatment, Awaken CoFlow™ helps with early field corn growth, seed placement dust-off, and maximizes your chance for higher yields. Awaken CoFlow is a nutritional corn seed treatment, combined with a seed treatment polymer coating that's been designed specifically for field corn. A multi-functional corn fertilizer, Awaken CoFlow is meant to help growers enjoy better early growth and gain a positive return on investment. Also, this smarter seed treatment contains a polymer coating aimed to increase seed flowability and decrease seed treatment dust-off. Awaken CoFlow is a nutritional corn fertilizer package that includes a complexed micronutrient package of seven nutritional ingredients, including: nitrogen, boron, copper, iron, manganese, molybdenum and zinc. All seven helpful ingredients are wrapped in a polymer coating used specifically for field corn in order to limit dust-off, while helping with precise corn seed spacing and flowability. For healthy, strong corn, and a positive return on investment come harvest time, make sure you choose the smarter seed treatment alternative, Awaken CoFlow. Exclusively found at your Nutrien Ag Solutions location. "AWAKEN COFLOW treating has started...and the finished product looks WONDERFUL!" "Working well and the finished product looks GREAT! You wouldn't believe the difference on dust-off!"